In this small Texas town, people pitch in to help out following the deadly blast at a local fertilizer plant. I learned the news about the explosion in West, Texas, the way you seem to learn everything these days - on Twitter, and then Facebook. I was actually in the middle of telling someone about West. It's where I grew up and lived until I was 20. When I saw the first tweet, I fell into the same trap I've been dealing with forever. I read it as "West Texas" and not "West Comma Texas." I thought the terrifying image I saw was from somewhere in El Paso and not the fertilizer plant that I saw from my front yard every day I was there. Then Facebook confirmed my mistake. Social media can be a curse to productivity and real-life connectivity on most days. But on a day like April 17, 2013, it was 100 percent crucial. I was able to see how my friends back home were doing, that they were OK, that they and their families were alive. 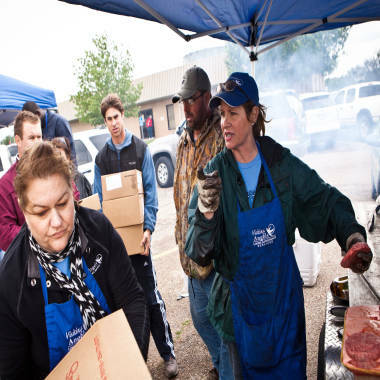 Volunteer Sarah Potter Davison, far right, of Visiting Angels Living Assistance Services makes burgers on April 18 at the West Community Center after the fertilizer plant blast in West, Texas. Everyone pretty much knows everyone else in West. The town is tiny - around 2,500 people, but it feels like fewer - and its roots are long and strong. Most people have Czech surnames. (My mother's maiden name is Sulak, pronounced "SHOE-lock.") It's the kind of place not many leave, and those who do often come back. My friend Mike Lednicky did that not long ago, to give his kids the same childhood he had experienced. It's the kind of place where people not only don't lock their doors all the time, but sometimes leave the keys in the ignition of their truck. It has a ‘To Kill a Mockingbird’-style town square and storefronts that haven't really changed in decades. If you were shooting a 1955 period piece, you could do it in West and it would take minimal effort to make it look the part. The houses spreading out north and south of there are solid nuclear family homes. Nothing extravagant or notable. They have nice-sized yards and kids playing in them. Not everyone lives next door to each other, but they are all neighbors. The fertilizer plant was about 100 yards from my old house - which may or may not still be standing. My parents, who left West for Waco a few years ago, still don't know. They won't let anyone close enough. Helping victims of the huge explosion in the small Texas town of West brings back hard memories for a veteran Air Force aeromedical evacuation nurse with PTSD. I could see that plant, and smell it, every day I was there. I played basketball in the park across the railroad tracks from it. The fertilizer plant is not the No. 1 job source in West. I don't know if anything is. Maybe the school district. It's not a factory town, is what I'm saying. People have jobs. Some are in West, some are in Waco. The school that was partially destroyed, and may be a lost cause, was my middle school. I had a fight with a kid in the apartment building that was demolished; we later became friends and he showed me his uncle's collection of throwing stars. The apartments were sort of an eyesore. It feels bad saying it now, but it's true. They were rundown when I lived there, and never got any better. Maybe a paint job here and there. And so the people who lived there were undoubtedly among the poorest in town, which always seems to be the way in these situations. My great-grandmother lived out her last days in the nursing home behind that apartment building. The head of emergency services, Dr. George Smith, was my doctor. My friend Mike's parents' house is gone. A lot of houses are gone. The explosion was the equivalent of a 2.1 earthquake, and it spit fire. It's not a huge stretch to say that everyone in Texas knows about West, Texas. Or, at the very least, they know about Czech Stop, the bakery/gas station/convenience store located just off Interstate 35 between Dallas and Austin. They know to stop and order a box of kolaches, the sometimes sweet, sometimes savory, and always delicious Czech pastries. If West is the unofficial Kolache Capitol of Texas, Czech Stop - to be fair, not even the best bakery in town - is its statehouse. 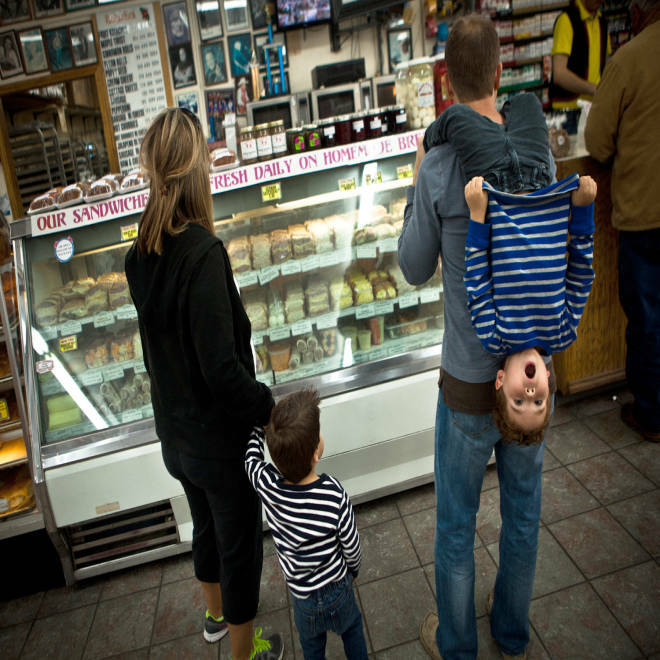 From left, Natalie, Callum, 2, Cohen, 4, and Chris Ball, pick out kolaches at the famous "Czech Stop" kolache bakery and gas station on April 18 on Interstate 35 in West, Texas. "Every time we drive through here we stop here and get kolaches, either on the way here or on the way back… we always stop here," said Natalie Ball. Willie Nelson grew up a few miles down 35, in Abbott. He had his first paying gig in West at the Nite Owl bar, a short walk from the piece of property off the highway where my mom's parents and her grandmother used to live, and where my uncle John still does. It may sound strange, since West has never had more than 3,000 residents, but for places like Abbott - and Penelope, Tours, Leroy, Tokio, Ross, and a handful of other pinpricks on the map - West is the big city. 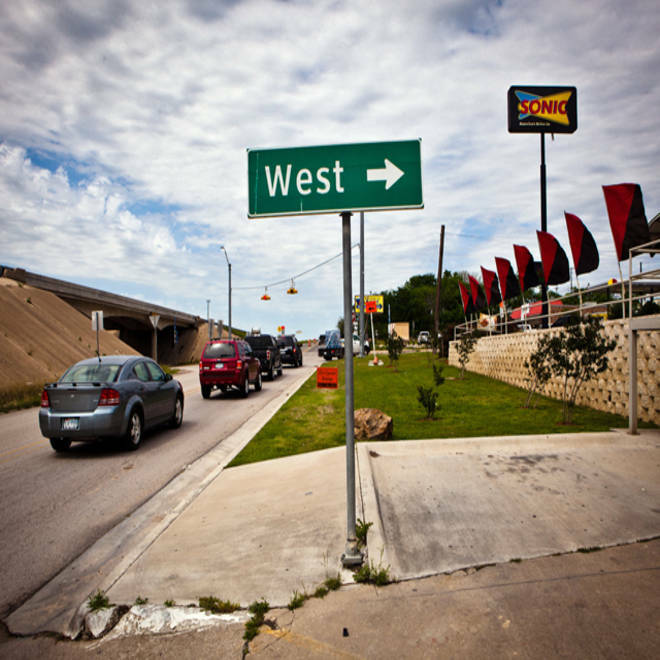 Until a few years ago, West had only one stoplight, and it was a flashing red. West is in my bones, no matter what. My mother's paternal grandparents were among the Czech immigrants who moved there around the turn on the century. Her father Ben and uncle Tony spoke Czech like natives. (When Tony went to Prague in the 1980s, everyone assumed he was a local.) Ben's wife Lee helped start Westfest, the popular Czech heritage festival that happens every Labor Day weekend, and my parents and aunt and uncle had a booth there for a number of years, selling beer bread sandwiches. That's how we paid for vacations. My parents moved back after college and finally left for Waco a few years ago after my dad retired. He taught fifth grade until he became an administrator, working as an elementary and junior high principal before serving as the district's superintendent for more than a decade. In a town the size of West, he was often the second call, after the sheriff, whenever something bad happened. He was my first call when I found out. Though they live in Waco, my parents still are tight with most people in West. They heard stories from the people they knew on our old street. From left, Damian Eismann, Brianna Ortiz, Raven Ortiz and Marina Castro eat snacks handed out by the Red Cross while taking a break from boarding up houses and broken windows with plywood on April 18 while volunteering for CenTex in West, Texas. They are from the Dallas-Fort Worth area and came to help out because they have relatives in West. Windows blown out and walls tumbled down. Houses completely flattened. He worried over the high school that he'd helped get built - across a pasture from the fertilizer plant - his only legacy to the town he lived most of his adult life in. We just talked again a moment ago. We talked about the names of the confirmed dead. I knew them all in one way or another: a school board member who served when my dad was the superintendent, the brother of one a classmate of my sister, the son of a neighbor. They were all volunteer firemen. West means a lot to me, maybe more than I realized. And it means at least a little bit to so many others. That was the one heartening thing about last night. My phone wouldn't stop buzzing, with texts and tweets of support from people who knew my history and knew West from their road trips. I stopped in West on the way home from Austin a few weeks ago. My friend Bob wanted - big surprise - kolaches. The last time I was really there was in September, for my high school reunion. I took a long look around my old neighborhood, in the shadow of that fertilizer plant. I'm glad I did, because it's mostly gone now, and whatever's left will never be the same. Zac Crain is a writer based in Dallas, Tx. This piece was expanded from a blog post that originally appeared in D Magazine.